George W. Bush’s mindset as president is one topic discussed in this program. February 5, 2010 article Ellsberg Documentary Attracts Wide Audience. 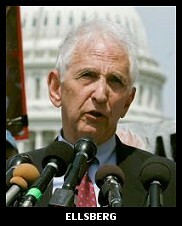 Ellsberg is the author of Secrets: A Memoir of Vietnam and the Pentagon Papers and other books. In their conversation, Dr. Caldicott and Ellsberg comprehensively discuss the dangerous problems of command and control of nuclear weapons, including the first-use policy which the U.S. maintained under then-president George W. Bush and still retains under current president Obama. They express their fears about the George W. Bush administration’s threatened use of nuclear weapons on Iraq in 2003. Dr. Caldicott explains why the world came very close to nuclear war in 1995. Ellsberg calls the continuing hair-trigger alert status of U.S. and Russian weapons “inexcusable.” Consider signing the Physicians for Social Responsibility petition to urge President Obama to de-alert nuclear weapons. They examine the U.S. missile defense system and how it is perceived by Russia and China, and the pivotal 1986 Reykjavik Summit between Ronald Reagan and Mikhail Gorbachev, which could have resulted in a treaty mandating total nuclear disarmament before the negotiations were derailed by Richard Perle. 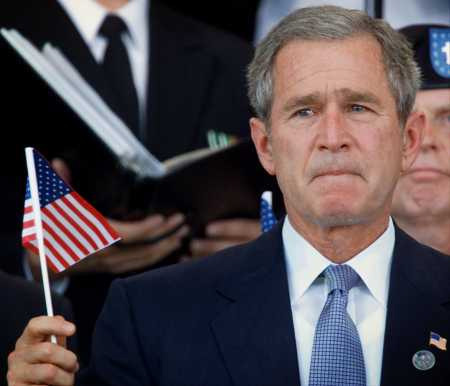 They delve into the psychology and attitudes of George W. Bush while he was still president, what he represented to the frightened American people post-9/11, and the lack of wisdom in allowing one person to control the fate of the earth with nuclear weapons. Dr. Caldicott and Ellsberg also ponder how to mobilize Americans to understand that the nuclear-war threat has not abated after the ostensible end of the Cold War. As explored in Dr. Caldicott’s recently-aired interview with Dr. Bruce Blair, U.S. and Russian nuclear weapons remain on hair-trigger alert and the U.S. president has only moments to decide whether or not to “press the button” in response to a perceived nuclear attack. Read Ellsberg’s August 26, 2009 article Hiroshima Day: America Has Been Asleep at the Wheel for 64 Years. Dr. Caldicott mentions the media-oriented think tank she created in 2003, the Nuclear Policy Research Institute (NPRI). NPRI is now Beyond Nuclear, whose focus is educating the public to demand the elimination of both nuclear weapons and nuclear power. Listen to Dr. Caldicott’s recent interview with Linda Gunter of Beyond Nuclear. Ellsberg recounts his experiences on right-wing TV chat shows which consistently lack antiwar voices to contradict the hawks who are allowed to dominate the discourse. He mentions how then-defense-secretary Donald Rumsfeld was selecting nuclear targets in Iraq before the 2003 bombing and invasion. For more with Ellsberg, watch the 30-minute interview he did in November 2009, Daniel Ellsberg Speaks With Matthew Hoh on Afghanistan. For more background on the topics in this interview, read Dr. Caldicott’s 2004 book The New Nuclear Danger: George W. Bush’s Military-Industrial Complex, which outlines the U.S. military’s long-range plans regarding nuclear weapons and the power of the Pentagon and nuclear weapons manufacturers. Most of these plans, and all the major nuclear weapons makers and their relentless lobbyists, are still in place under President Obama, who has not blocked the continued expansion of the U.S. military budget. The U.S. military is very reluctant to abolish its nuclear “deterrent.” See the January 4, 2010 Los Angeles Times article Obama’s nuclear-free vision mired in debate: Pentagon officials have pushed back against the president’s goals to shrink the U.S. stockpile and reduce the role of such weapons in foreign policy, sources say. Once nuclear weapons are marked for disarmament, it make take more than a decade before they are removed. Read U.S. warhead disposal in 15-year backlog. In the second half of this week’s program, we hear an interview Dr. Caldicott just completed with Professor A.R. Ravishankara, director of the Chemical Sciences Division of the National Oceanic and Atmospheric Association’s Earth System Research Laboratory in Boulder, Colorado and an Assistant Professor in the Chemistry and Biochemistry Department of the University of Colorado. His work focuses on the chemistry of the Earth’s atmosphere, ozone depletion, climate change and air quality. Prof. Ravishankara has won the American Chemical Society’s Award for Creative Advances in Environmental Science and Technology and the Presidential Rank Award for exceptional contributions to understanding atmospheric chemistry. Dr. Caldicott and Prof. Ravishankara examine the state of the ozone layer and the chemistry of Earth’s atmosphere as it relates to climate change. As background on Prof. Ravishankara’s most recent findings, read the 2009 articles Laughing gas is biggest threat to ozone layer and New Culprit Seen in Ozone Depletion. Dr. Caldicott asks Prof. Ravishankara to outline the role of banned chlorofluorocarbons (CFCs) in depleting the ozone layer, and how ozone is formed. He explains the science of CFCs - formerly used in refrigeration, hairspray, foam insulation, and other applications - in ozone destruction. CFCs were banned by the Montreal Protocol in 1989. Prof. Ravishankara also talks about how CFCs are potent global warming gases, and how “banks” of CFCs, produced long ago, could still be emitted from old refrigerators, foam, etc. to destroy the ozone layer if not properly captured and destroyed first. Dr. Caldicott asks Prof. Ravishankara to differentiate hydrochloroflouro-carbons (HCFCs) gases from CFCs. HCFCs are now used in place of CFCs, but they have their own problems. Read the article CFC Substitutes Fix Ozone Hole, But Speed Up Global Warming and about the study Epidemic of liver disease caused by hydrochlorofluorocarbons used as ozone-sparing substitutes of chlorofluorocarbons. They next turn to nitrous oxide (N2O). He elucidates how industrial use of N2O in agriculture and sewage treatment has greatly increased the natural concentrations of this gas in the lower and upper atmosphere. Prof. Ravishankara outlines how continued use of N2O will sabotage efforts to restore the ozone layer. Prof. Ravishankara talks about how N2O is a significant contributor to climate change (responsible for 6% of greenhouse gas emissions), another reason it should be banned. Read an abstract of Prof. Ravishankara’s nitrous oxide study, Nitrous Oxide (N2O): The Dominant Ozone-Depleting Substance Emitted in the 21st Century and the related article Nitrous oxide fingered as monster ozone slayer. Dr. Caldicott and Prof. Ravishankara next look at methyl bromide, a pesticide that was banned because of its effect on the ozone layer. Read the 2005 Mother Jones article U.S. farmers ignore international treaty on methyl bromide and the November 13, 2009 Mother Jones article Obama’s Pesticide-Pushing Nominee. Also see An EPA-approved pesticide is worse than the one it’s replacing and California mulls controversial alternative to methyl bromide; some scientists protest, saying chemical is too toxic and the report Examining the evidence on pesticide exposure and birth defects in farmworkers. Dr. Caldicott steers the discussion to nitrogen trifluoride (NF3), used to make flat-screen computer monitors and other commodities. Prof. Ravishankara explains the danger of NF3 in contributing to climate change, but he says that NF3 is not an ozone-depleting chemical. Read The missing greenhouse gas: Growth of the electronics industry will boost emissions of a ‘hidden’ — but extremely potent — greenhouse gas and The Greenhouse Gas That Nobody Knew. November 11, 2009 article Climate Action Under Ozone Treaty on Hold for Copenhagen Deal. Also check out the December 2009 articles Antarctica may heat up dramatically as ozone hole repairs, warn scientists and Healing the hole in the ozone layer could heat Antarctica. Also see the September 2009 article The size of the hole in the ozone layer and the January 4, 2010 article Why mountains are bad for the ozone layer, a piece originally published in Geophysical Research Letters. This entry was posted on Monday, January 4th, 2010 at 12:00 am	and is filed under Uncategorized. You can follow any responses to this entry through the RSS 2.0 feed. Both comments and pings are currently closed.